It has been a long while since I’ve played a side-scrolling run-and-gun like this. I’ve dabbled in a few, but “really played”… it’s been some time. 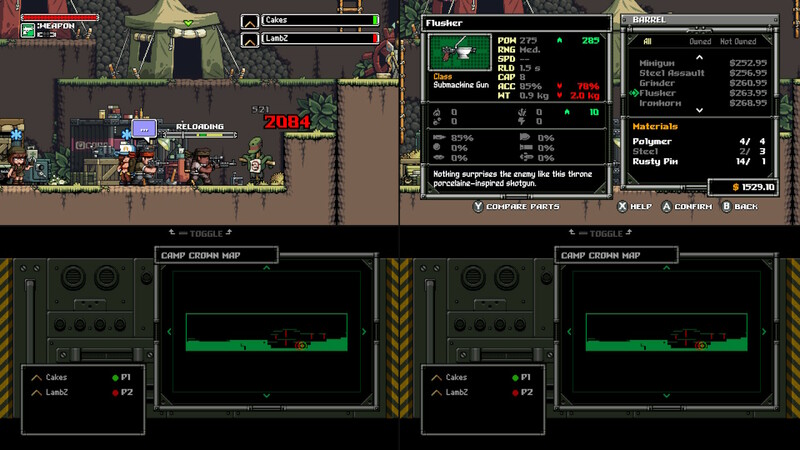 Mercenary Kings: Reloaded Edition takes me back to the days I played Metal Slug in the arcade. (Anyone remember going to an arcade?) Either way, Mercenary Kings doesn’t simply stop at creating something in the same genre, there is so much more depth here and while I’m improving, it’s not very nice to me. Is it worth picking up though? Let me break it down for you. So while there is a story here and they did put some thought into it (I’m not trying to make a dig here, but I’ll admit it sounds like it), like Jackie Chan in The Foreigner, it doesn’t come off as necessary. Or… it’s about as important as a 80’s/90’s action flick plot-line. Don’t overlook it though as there is some good information in it. You’re the good guy and there’s some really unfortunate bad guys that are in desperate need of some bullets and you’re in charge of the charity. It gives you a reason to go and rescue people who will help flesh out your base and upgrade your weapons. While we’re here to spread some peace with a knife, the writing is humorous and gets a giggle out of me quite often. Sometimes you’ve got to capture baddies instead of killing them. This is only difficult when you don’t bring things to capture them with you… or lack the knowledge on how to use them because you’ve skipped the writing. Seriously though… horizontal split-screen would have been glorious, but this works well. The difficulty can seem pretty crazy at times. Up front it might be. Obviously the bosses will seem a bit rough at first. If you read everything about everything some objectives are made “easier”. At the same time, I would put Mercenary Kings on almost the same level as Ghost & Goblins. It is easier, but the method of making the game difficult is the same. It’s all about patterns. There is a small penalty on death with the loss of money, but you can always get more of that by repeating some of the many, many levels available. You’ll probably need to end up doing that anyway for resources to craft better guns or armor as you progress. The difficulty is all about patters as I said. Duck, move and shoot. The platforming isn’t as difficult as juggling the dodging of bullets and reloading. Stick with it and you’ll get it. Time can get short, but I have run out of time only once because I was busy hunting resources instead of the mission goal. Remember, you can always get more resources, just remember to have time to finish your objective. Yes. There are a lot of options when you’re building weapons. Some are outlandish, but hey… sometimes you’ve got to cut people with a fish or shoot people with a toilet. It’s a crazy world. Speaking of multiplayer, I’ve got mixed feelings about how they implemented the split-screen. I’m mostly glad they did it the way they did because it could always have been worse, but I would have loved a two-player split-screen option. You know, where the screen would have been divided horizontally once giving more viewing room to each player. As it stands, the map is always up on two-player co-op directly below each player. I’ll grant them that it is pretty convenient, but I always like having more “play” room. 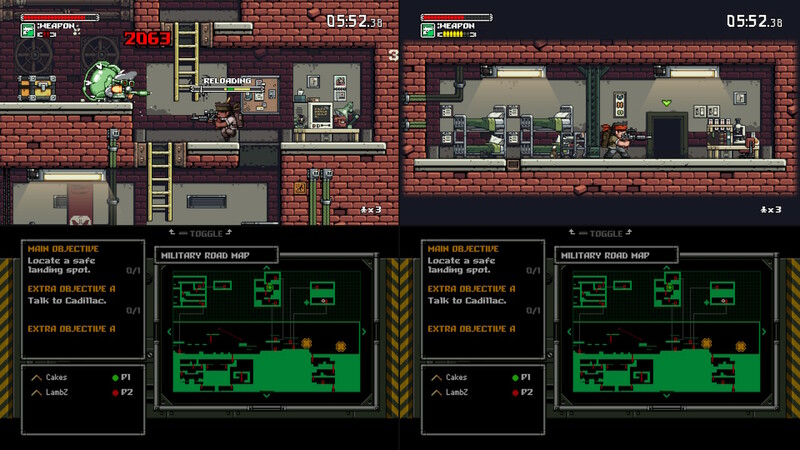 While I love the co-op between four players, Mercenary Kings looks so good running solo. The pixel graphics look super-sleek full-screen. It’s nice in handheld mode, but I only play single-player undocked. I’m not about to split the Switch’s screen into four. Resources gathered seemed to be shared. I swear I’ve seen other players receive different materials when another player loots something, but it mostly seems to be the same. (I could be imagining things again.) 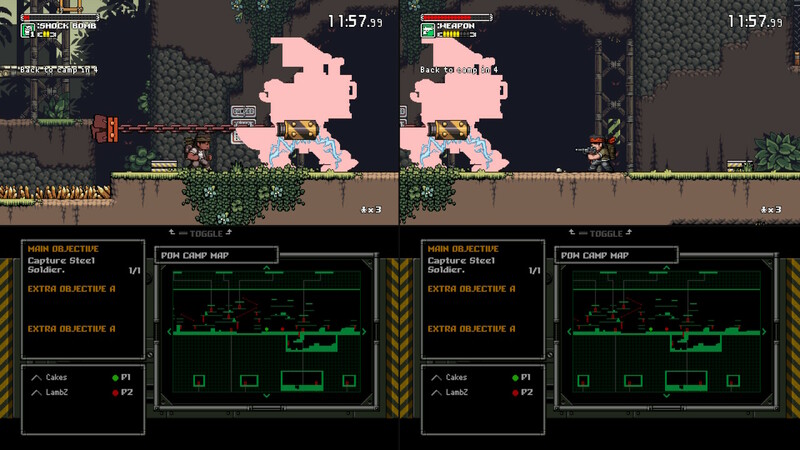 The player who starts the match picks the missions and sets what levels and sets of guns are unlocked, and each player buys his own upgrades with his/her own resources. I debated a lot over the rating for Mercenary Kings: Reloaded Edition. I really am enjoying my time with the game and all of my frustrations with it are selfish. They can’t make a “better” gun without making it overpowered and the game would be broken at that point. I would have preferred them to split the screen horizontally for two-player co-op action, but having the map constantly there is a benefit as well. The difficulty barrier can be surmounted with a bit of patience and endurance. The more time I spend in-game the more and more I find myself enjoying it. The good thing is there is a lot of content to go through so I’ll have plenty to do. If you’re looking for a good side-scrolling shooter with weapon upgrading and excellent co-op potential, I can’t think of a better way to spend your money on the Switch.